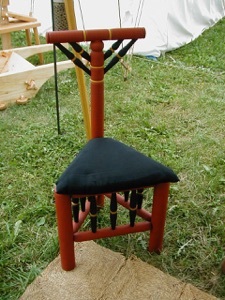 The spring pole design proved versatile. 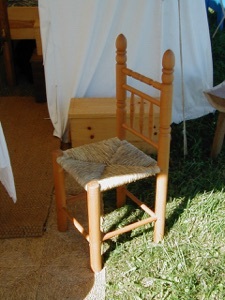 It could be made light and portable, important to craftsmen who might travel to where raw materials were plentiful. It was relatively easy to build and required few parts that the turner could not himself make. There are drawbacks to this elegant design however, such as relatively slow turning speeds and limitations on the size and weight of the object that could be turned. Yet despite these limitations, the spring pole lathe would remain popular well into the 19th century among chair makers and other traditional crafts. A turner and some of his wares, from the "Book of Trades," 1568. I have found very little evidence that wood turners used continuous rotation lathes prior to 1600, though pewterers and other metalworkers clearly did. In 1550 a lawsuit was brought against "old Peverell" because the noise from his "tornyng whele" was annoying his neighbors; but it is unclear if Peverell was a wood turner. 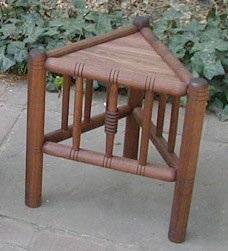 The lack of continuous rotation lathes may have been due to the higher cost, the adequacy of pole lathes, or it may have related to guild restrictions. 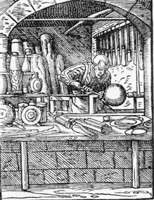 In urban areas such as London, guilds (or companies) restricted the tools and techniques that a craftsman could use. 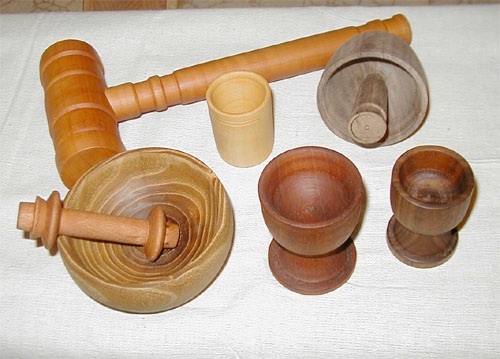 Even so, there were numerous disputes over who was entitled to use a lathe, and efforts to settle the dispute through company charters met with limited success. (10) Among rural craftsmen, restrictions were less stringent and individuals were more at liberty to practice multiple trades (or at least use their tools). (11) Among those craftsmen who observed guild restrictions, the work of a turner was marked by round mortises and tenons, pegged or wedged in place. 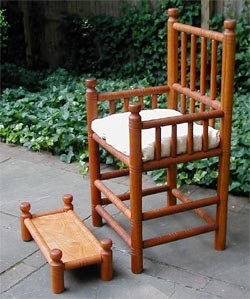 (12) The cutting of square mortises and tenons was reserved for joiners, who might contract out the turning for a piece or, if skirting the restrictions, hire a turner to work in his shop or simply turn it himself. 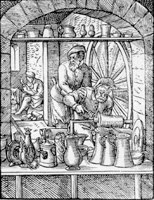 Pewterer, using a Great Wheel lathe turned by an assistant, from the "Book of Trades," 1568.